Groom’s wear or wedding attire is considered to have a paramount importance and hold great significance. Every man wishes to have the best attire for his special day. He undoubtedly wants to look flawless and exceptional and definitely wants that his look and the wedding sherwani turn the heads when he walks in. Like women, men are also very conscious and concerned about the design and the style of his wedding attire. When the wedding season is around, any man cannot refrain himself of thinking about the latest trends, designs and collections of wedding sherwani. Especially for a groom, it gets hard to decide for the brand, suitable designs and latest styles in fashion. The groom looks for mesmerizing designs for sherwani crafted under keen guidance and supervision of the designers. The designer label holds great importance and significance because the better the designer, the more exclusive is the collection. 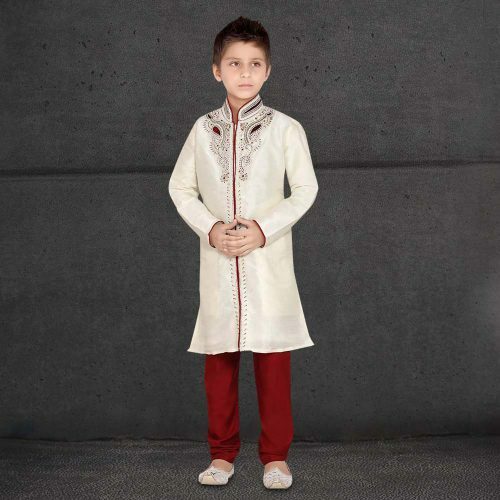 Dezynish comes with a huge sherwani collection to fulfill your needs and requirements. Beautiful and utterly elegant work and details make it a triumph to wear on special occasions. Having a flawless fabric with magnificent work and patterns on it makes the wearer have a distinctive, representative and captivating appeal. Taking cues from the cultural heritage and marrying them to the contemporary needs; Dezynish offers the best and is redefining the sherwani collection and taking it to the next level. Dezynish offers fusion and sophisticated blend of beautiful traditional designs with modern contemporary and sleek styles that cannot be compared. They offer sherwani that give you confidence and satisfaction of looking like a charming and ravishing person on your event. Dezynish offers extremely classy and beautiful wedding sherwani collection that can surely fill your desire of looking radiant and will definitely dish out compliments from the people there and will surely make your big day a memorable one.